A real Louie original, the groundbreaking Legend 3217 Belt Squat Machine allows a person to get a full squat workout in the legs and glute area without putting a bar on your back. 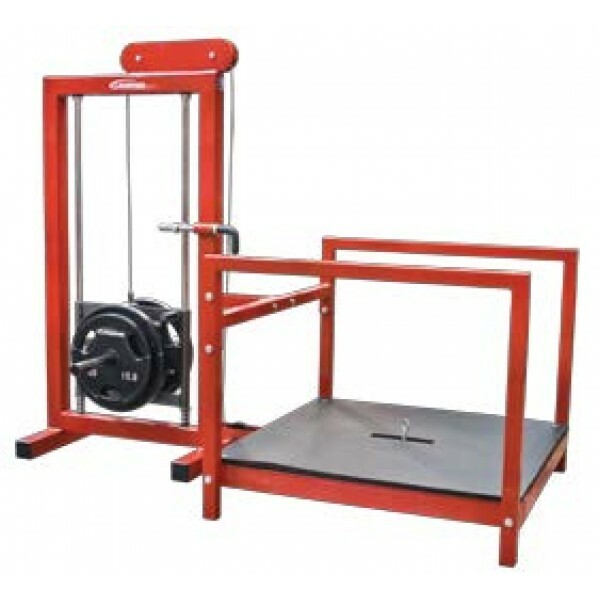 Simply load plates on the weight pegs, step onto the platform, hook the cable to the supplied squat belt and go for it! The Westside monster deckplate offers plenty of platform space for safety and stability during set-up, execution and conclusion of the exercise, as well as versatility. The Belt Squat Machine will allow everything from a close, athletic stance to a sumo stance. Add to this split squat stances, staggered stances, box squats, even stationary lunges! But don't be limited by the name of this remarkable device. Exchange the belt for other attachments and the multipurpose nature of this machine can be fully exploited. Attach a pair of web handles and do pull-throughs. Use a V-grip to do deep grip pulls. Clip on a small straight bar for shrugs and dead lifts. Attach a single hand grip and do rows, curls and tricep extensions. You can even hook up a lat pulldown bar and do Zercher squats! Don't be limited by the pendulum action of imitators. This is the first and original Belt Squat Machine, born at the infamous Westside Barbell.